My group focused on Standard A, and I focused particularly on the third aspect of this standard: incorporates contemporary adaptations along with the historical and traditional aspects of the local culture. I want to get students thinking creatively about contemporary ways to tell stories, but I also want them to be able to draw on the lessons of traditional stories and legends. I think I would start by discussing the differences between written and oral versions of the same story. I would try to find a storyteller who could come in and tell a traditional story to the class. Then I would assign students a written version of the same story to read, and we would discuss the overall lessons of the story and any differences between the two versions. From here, the assignment can branch in two directions. Students could collect a book of stories – get permission from Elders to record them telling stories and make transcripts. Or, for a smaller assignment, students could discuss traditional stories, identify central themes or lessons in those stories, and then write contemporary stories of their own that have the same themes and lessons. The stories would not be adaptations of the traditional stories – they would be original creative works, but they would draw for inspiration on the purpose and meaning of the traditional stories. I like this lesson idea – I’ve heard lots of ways to approach traditional stories over the past few weeks, and this resonates with me. I’ve heard a lot of comparing traditional stories to fairy tales, but that seems shallow. The idea of comparing the different versions of oral tradition stories as the basis to write a modern version is awesome. It reinforces the values of those stories, and helps the students bring those stories into their lives and community. Katy, this is an awesome idea for a lesson plan based on Cultural Standard A. I like how your lesson plan gives students the opportunity to explore the differences between written and oral versions of the same story and make connections and meaning from their exploration. This could lead students to some very interesting insights on how oral and written transmission systems work: i.e. thoughts on style, delivery, content, voice, etc. I love your lesson activity for writing a contemporary story with the same themes and lessons as the traditional story studied earlier in the lesson. 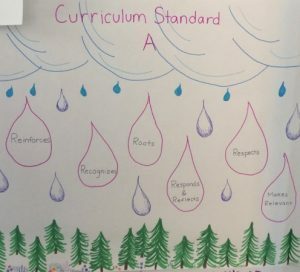 This provides so much potential for the students to make connections and meaning with the knowledge they gained in reading and listening to the traditional story, and it allows for a creative way for students to apply and express that knowledge as a part of their own experience. It has so much depth as a learning activity. I would love to see this lesson in action!